High Temperature High temperature causes pressure to build up in the fuel container. 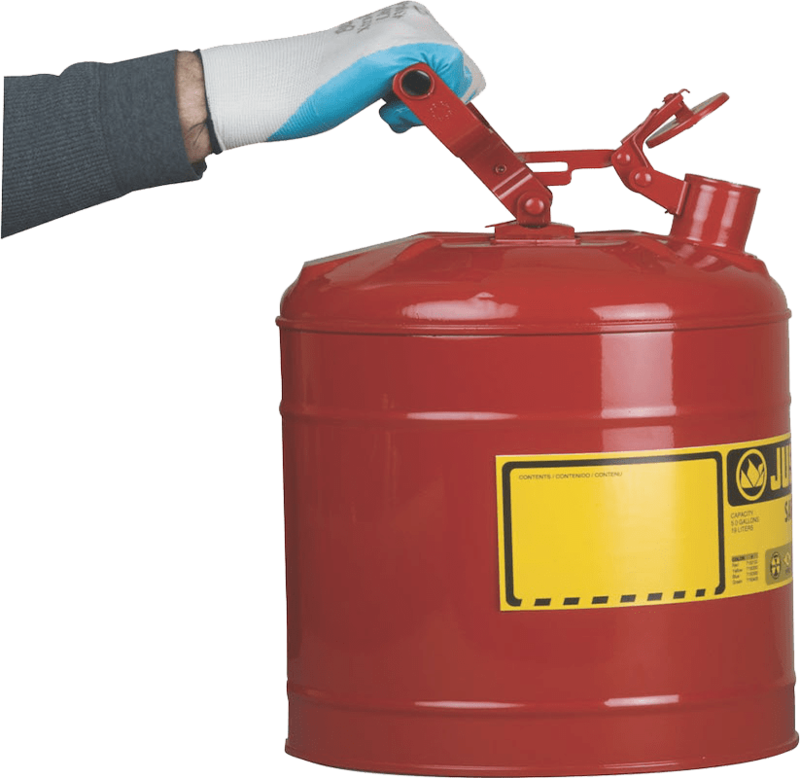 The safety gas can is designed to vent once the pressure valve rating reaches 3 to 5 psi. But, pressure below 3 psi can still be too high, if the pressure is not relieved safely for use. It may also cause material loss, if the content within the can reaches its boiling point. Keep safety cans in shade to avoid extreme temperature changes. This also minimizes material loss. 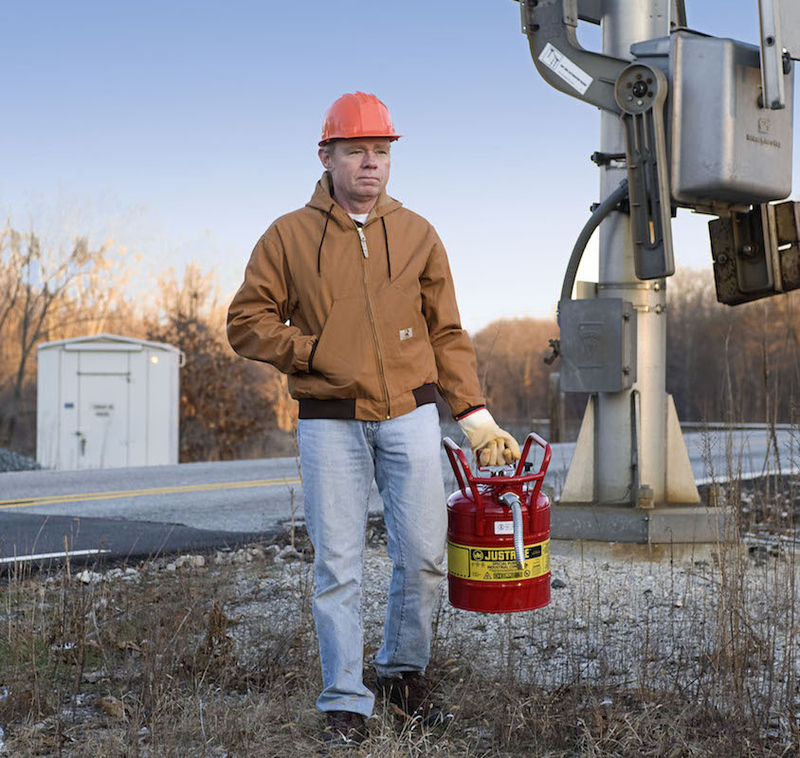 Burp your safety gas can (i.e., relieve the pressure) to balance internal and external pressure. Make sure the can is setting flat when this is done, not tilted or dispensing liquid, to avoid a burst of fluid and back splash. Sudden cooling from high to low temperature Certain climates, such as deserts, experience extreme variances in temperature. When the temperature drops at night, the pressure inside the safety gas can also drops, forming a vacuum. In rare cases, this vacuum can implode the safety can. Cover or shade your fuel containers during the day. This helps minimize the temperature swings from day to night and limits the possibility for vacuum formation. Burp your safety can at the end of the day to relieve pressure. Keep the liquid level in the can at or above 50 percent. This reduces the vapor space and lowers the risk of a vacuum imploding the can. Punctures or dents Outdoor environments are harsh on safety fuel containers. Sharp rocks or side impacts can damage safety can bodies. Conduct regular inspections to ensure that your safety can remains in good condition. Always replace damaged cans. Use fuel containers with raised bottoms and reinforcing ribs on the side for resistance against side and bottom impacts, such as Justrite Type I or Type II safety cans. Always replace damaged cans. Transport Safety gas cans may move around the vehicle causing spills or damage. They may also heat up excessively if left in a confined space. Secure safety cans during transport to guard against sudden braking or centrifugal forces. Always transport safety fuel containers in a well-ventilated vehicle. Never leave it in a closed vehicle. If transporting gasoline for use in performing one’s job, remember the U.S. Department of Transportation’s (DOT) material of trade rule. 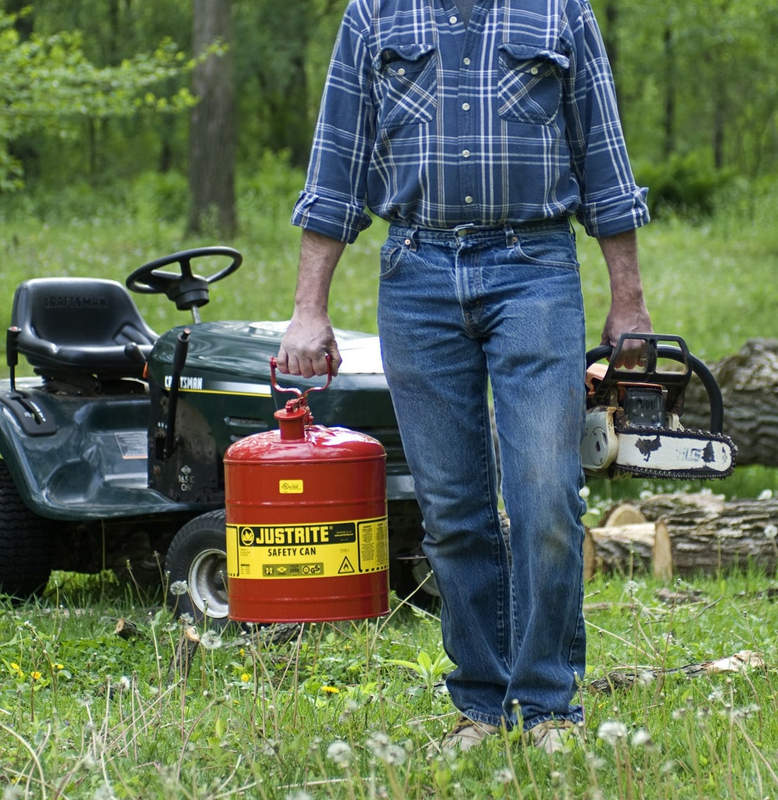 It allows up to eight gallons in approved safety gas cans or DOT/UN Certified safety cans. Always allow equipment (such as pumps, etc.) to cool before refueling. Always use proper grounding and bonding techniques when dispensing fuels with a flashpoint below 100 F. The metal flexible nozzle on Type II safety cans offer quick bonding between containers. 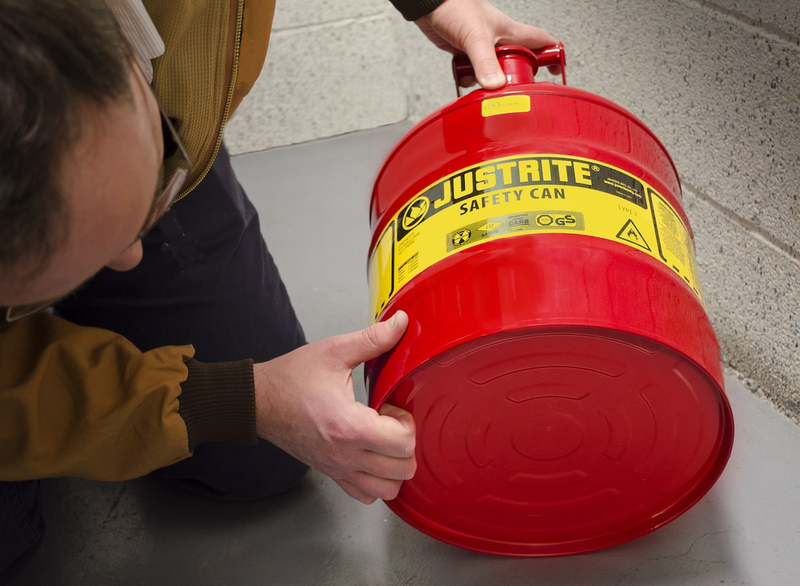 Justrite safety cans provide the safety features to store, dispense and transport gasoline and other products. Browse our catalog of options here and order your Type I, Type II or DOT safety cans today.